A MAGICAL AND ENCHANTING PERFUME, A PROMISE OF CHARM AND SEDUCTIVE FEMININITY. A FLORAL AND FRUITY FRAGRANCE. AN ELIXIR OF ETHEREAL AND SURREAL ELEMENTS TO SEDUCE THE SOUL AND IMAGINATION. The notes feature tangerine blossom, wormwood, sea salt, hibiscus, cattleya orchid, waterlily, amber, cedar and white musk. Other recent launches from Moschino: Cheap and Chic Hippy Fizz. 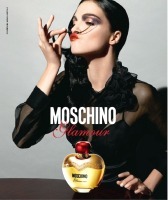 Update: Moschino Glamour was developed by perfumer Veronique Nyberg. Haven't found a Moschino to love, but their magazine ads and packing are always so fun. The notes are of this one are interesting – wormwood and salt – will have to check it out. It does sound interesting — hope this one will come to Macy's. The ad w/ the model smelling her hair doesn't appeal to me though! Funny, I thought she was just twirling her moustache and puckering at the same time, not smelling anything. I think she is doing a bit of a Dali impersonation. I'm so used to seeing the Moschino bottles that remind me of Olive Oyl that I probably would have walked right past this. I think she's making a fake moustache out of her own hair – I, eh, do that myself sometimes. At least that's what it looks like to me… which makes me kind of want to like the fragrance, but judging from the notes it's not going to be my cup of tea. I love that ad!! Lol!! Agree, but don't like the ad. It doesn't sound like my cup of tea either. I love Moschino Couture, I wonder how it will compare. I go to test this at Macys 2day and I really loved it. I really loved the bottle 2! Its a fun little scent and I think I may just have to get me a bottle. I really loved the salt in it which is so weird to me! Its interesting. Drat — I know I smelled it once, but can’t remember it at all! I got a 5ml bottle of this one, and am loving it. Can’t wait to get the bigger bottle. P.S. could someone suggest anything similar to it? I have never smelled it so will be no help, sorry!